Fancy is a beautiful female who gives all of us here at Castlewood, a great deal of joy. She has produced some gorgeous puppies for us that have found wonderful homes very quickly. We’re proud to say, Fancy’s English bulldog puppies are happily living in several homes throughout the United States. Here on Fancy’s page, you see her impressive lineage. We have laid out her pedigree (or family tree) so you can see just how much care and attention we pay to preserving this historical breed. 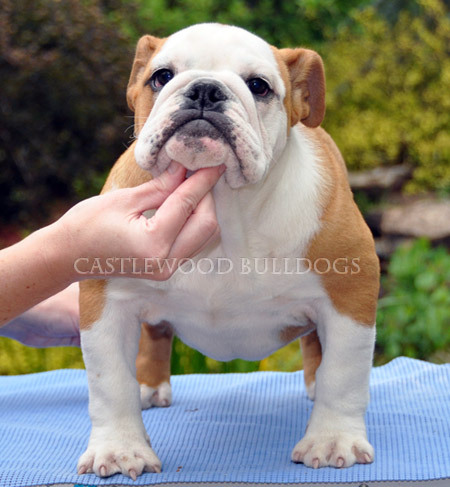 You can also view our gallery were you can enjoy images of the whole Castlewood Bulldog family. If you are considering owning an English Bulldog, then we advise you to take some time to learn all you can about this amazing breed. We have taken the time to share as much detail as possible about Fancy, and each of our dogs. And we’re more than happy to answer any questions you might have. Here at Castlewood, as English Bulldog breeders, we take much pride in our reputation. We work hard to protect the breed, and make sure every one of our puppies is healthy, happy and placed in a loving, forever home. Fancy is a wonderful dog, and much loved here at Castlewood. She is an attentive and gentle mother, and has produced some beautiful puppies for us. If you are fortunate enough to own one of Fancy’s puppies in the future, you will have a charming, loyal and spirited companion to share many happy years with. All our puppies are carefully homed with loving, caring and nurturing families where they will be happy and content for the rest of their lives. If you would like to find out more about English Bulldogs, our breeding program, or when Fancy will have her next litter, please get in touch.